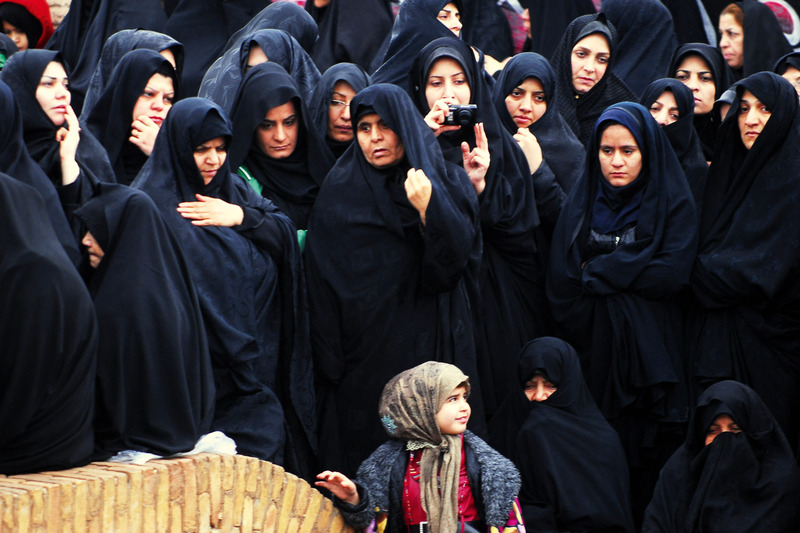 A tale of beauty and belonging in Iran. My husband and I stepped out in the early morning into the conservative world of Kashan, a pious city a few hours south of the Iranian capital of Tehran. A light drizzle was sending meandering trickles of water down the main road; trickles tinted a deep blood red so that the street resembled a macabre Jackson Pollock painting. It took only a few minutes to discover the source. At regular intervals along the street, ovines were in various states of sacrifice: tethered to a tree and blissfully unaware their life was nearing end; laying in a gutter, jugular veins a distant memory, some still twitching; slung up in trees being skinned; the finished product, still hanging in those trees, primed for the afternoon’s barbecue. Ashura is a public holiday in Iran, a commemoration of the martyrdom of Imam Hussain, grandson of Prophet Mohammed, in 680AD and the catalyst for the current bloodshed. So what if the history is hazy and the documentation sketchy, Shia Muslims hail the Imam of Imams as an emblem of freedom, justice and virtue for confronting, with his ragtag band of 70, the tyrant of the period Yazid and his muscled-up army of tens of thousands. The legacy is Ashura, one of the more sacred days on the Islamic calendar. It’s also a day you don’t want to be a sheep in Iran. If you are queasy, Ashura isn’t an ideal day to be outdoors. As a vegetarian I was riveted; mortified but unable to avert my gaze. The blood-letting and subsequent feast is an earthy equivalent to carving the Christmas lunch turkey. Iranians just cut out the middle man at the local butcher shop. The feast is, in essence, the cherry on top of Ashura, the pay-off that follows the more reverential portion of the day. In the Christian world this reverence would be the Christmas Day mass. In Kashan, however, it is the polar opposite to sitting at a pew reciting prayers and punching out a hymn or two. We were eager to peer into the window of these devotees’ world but being overt outsiders of a different faith (actually of no faith but that’s a tough concept for Iranians to grasp) we were on the back foot as to where the line was drawn for non-Muslims imposing their curiosity. Step up to the plate Iranians showing hospitality. Far from being a fundamental religious clique spurning faith aliens, the citizens of Kashan enthusiastically greeted us like long lost siblings and ushered us inside the walls surrounding a large plot of land in order to witness veneration à la Persia. Having adopted the role of minor royalty, we were beckoned up onto a wall surrounding a pond where a group of around a hundred men were going through a choreographed routine resembling a testosterone-enhanced game of Simon Says with equal degrees of hormones and true belief; Simon says pat your heads; slap your chests; throw your arms in the air. Couple that with a ritualised chant and the atmosphere was electric. Atop the wall watching the proceedings, we found ourselves in the company of a representation of the other half of Kashan’s citizenry. Clad head to toe in basic black chadors, the mobile eyes of the town’s women were simultaneously observing both the proceedings below and the two westerners looking completely out of place nearby. At the conclusion of the theatrics, we were besieged by all and sundry – the most animated being the youth who were falling over themselves to pose for photos, shake our hands, welcome us with the warmest of Persian smiles, and generally treat us like a gift direct from Allah himself. The formalities over, it was time for a street passion play to re-enact that folkloric day of over 13 centuries ago before hitting the mosque of their choice. The mosques, we were graciously informed, were out of bounds to us during this period of prayer but we were genuinely thanked for sharing in the celebrations. Such elaborate routines were unfolding all over the city as a prelude to the feast. The people of Kashan had earned their mutton stew and rice. Unfortunately we hadn’t, which presented an issue. Being a public holiday, everything was shuttered for the duration, including the few eating establishments that do exist. But the solution is simple: walk the streets aimlessly. First one car, then another pulled over. Within minutes we were surrounded by Iranians once again welcoming us into the heart of their nation. No subtext, no hidden agendas, just an innate desire to receive guests to their country as warmly as possible. From the boots of their cars, the drivers would emerge with plates of food we otherwise couldn’t have procured. Sitting by the side of that busy street on a drab afternoon in central Iran in the company of strangers, tearing off clumps of flat bread to be used as a substitute for cutlery, we sampled a variety of local rustic cuisine. Such a dining scenario may not trouble the good judges of Michelin but as unique experiences go, this one was off the charts. The hospitality offered to us was so kind, so warm, that I didn’t dare refuse any dish that was enthusiastically pushed into my hands. If only I could have purged the memory of all those sheep that recurred with each mouthful. If you’ve always wanted to be a published travel writer, here’s your chance! Penny Colvin has won a Sleek Photo Hatchback AW Series daypack valued at $109.